Dutch model Marloes Horst reunites with photographer Will Davidson and stylist Jillian Davison for a mesmerising editorial in the April 2012 issue of Australian Harpers Bazaar. 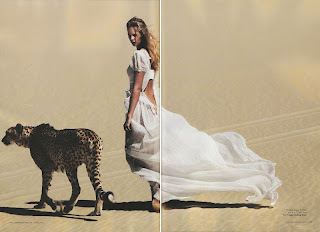 The editorial which was shot on location at the Samara Private Game Reserve in South Africa, features beautiful, sweeping landscape shots and a rather imposing-looking cheetah. Horst manages to maintain her composure whilst posing alongside her new feline friend, adorned head-to-toe in white ensembles courtesy of Hermés, Jean Paul Gaultier, Dries Van Noten, Gucci, Chanel and Kiki de Montparnasse. 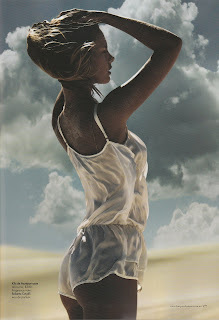 Davidson combines the beauty of the natural elements with Horst's unadulterated exquisite beauty, creating pure magic. Davidson is fast emerging as one of the most definitive talents amongst the next generation of photographers and contributes regularly to i-D, Dazed & Confused, Muse, Russh Magazine, and the Australian editions of Vogue and Harpers Bazaar. This certainly an extraordinary shoot, a pleasure to see.